During the winter we try and keep our home closed up tight to keep the cold outside. This causes the air quality in our homes to change. Homes are made to keep the winter weather out, which is a good thing when trying to stay warm. However, it’s not such a great thing when it comes to air quality inside of our homes. Bad air can get trapped inside and then continuously circulate throughout your home. Here are some simple ways you to help improve the air quality in your home this winter. Your furnace filter is the first line of defense against large particulates circulating throughout your home. Take the filter out of your furnace and hold it up to the light. If you can’t see light through the filter, it’s time to change it out. 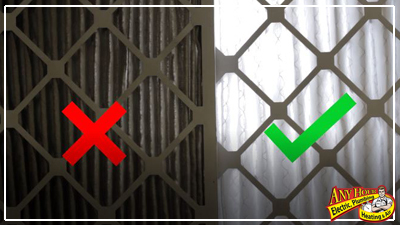 If the filter is dirty (lots of dust particles/can’t see light through it well), change it out with a new one. Also, check what the MERV rating is on your filter. Poor quality rated ones (ones with a low number) won’t do as good of a job as a higher rated one. We recommend getting a filter within the range of MERV rating of 7-12. You can read more about this on our Ask Any Hour - Furnace Filter blog post. One of the simplest ways to improve indoor air quality is to keep surfaces clean. Regularly sweep and vacuum the floors to keep dust down and consistently wipe down tables and countertops to keep germs and other bacteria to a minimum. 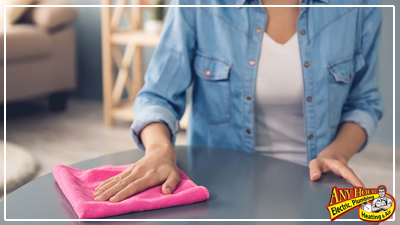 When dusting, it’s also a great idea to wipe down surfaces with a rag, using furniture polish, as opposed to using a feather duster, for example, that will release the settled dust back into the air. Be sure to also keep the leaves of your plants dust-free by wiping them gently with a wet cloth. This will allow them to continue to “breathe” freely and help keep the air clean. Plants are an inexpensive, decorative, and organic way to scrub some contaminants out of the air. Not only do they take in CO2, but they increase oxygen levels in the home and remove myriad other toxins, such as benzene, formaldehyde, mold, and others. However, not all plants are as effective as others. 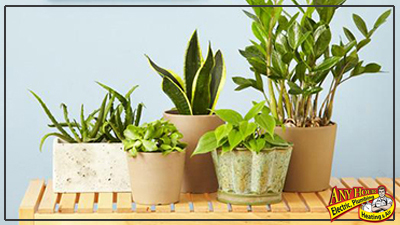 Some of the best plants to use inside your home are English Ivy, Boston Fern, Spider Plant, Peace Lily, Bamboo Palm, and Aloe Vera. Those who have severe allergies or sensitivities could benefit a lot from getting an air purifier to help with cleaning the air in their home because a lot of times regular cleaning just isn’t enough. There are a few different options for this. Special Air Filter: attaches to your furnace to trap more dust and particles then a regular filter does. UV Light: installed on HVAC system and kills harmful microbes such as germs, viruses, mold spores, and chemicals in the air that enter the system. Whole-home Purification Systems: installed on HVAC system and sends hydroperoxides into the air to destroy microbes (ex Reme Halo). For more information on this and other technologies, talk to your HVAC professional to see which solution might be the best fit for your family. 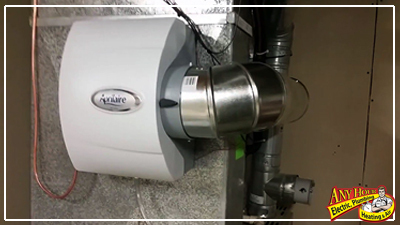 A whole-home humidifier works at fighting the effects of winter dryness like itchy skin, too much static, and dry nasal passages along with your HVAC system. This might be a good option for you if you have a dry home. It's important to have a professional inspect your unit annually. Old furnaces often fail to properly clean the air in your home. 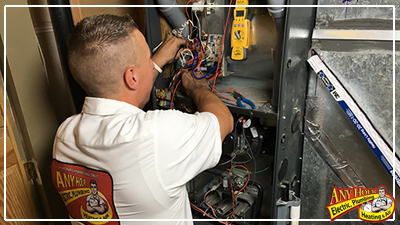 If your home feels stuffy and stale or you begin to notice an increase in allergy symptoms, frequent static shocks, drooping plants or cracking furniture, your old furnace may be to blame. In addition, as combustion furnaces age, the risk of the heat exchanger developing cracks increases. Annual furnace inspections are essential – even on newer furnaces - for detecting these often invisible cracks which could lead to carbon monoxide poisoning. If your furnace is in the 16-20 year age range, it may be time to start shopping. Of these tips, staying on top of your HVAC maintenance as well as changing your filter regularly will make the most difference in having cleaner indoor air because that is where the heat originates. Hopefully, you can use some of these tips to improve the air quality and circulation inside your home and help you and your family breathe a little easier. © Copyright 2018 Any Hour Services. ALL RIGHTS RESERVED. Submit your question and we will email you a response as quickly as possible. These questions and answers may be added to our website to serve the community as best as we can. Thank you for your question! Enter your email and we will send you our coupons immediately. Our hours for responding to text messages are from 7am-8pm Mon-Sat. We are closed Sundays. If you still want to send a text, we will respond the next working day.